Futaba Transmitter Crystal for Radio Control Model Aeroplanes and Helicopters. Futaba 35mhz Transmitter Crystal. Should the winner believe that the item is misdescribed. Futaba Receiver Crystal for Radio Control Model Aeroplanes and Helicopters. Futaba Receiver Crystal. Should the winner believe that the item is misdescribed. The price is for. Shown are a sample, I have many other channels. Can be used in other receivers, not just those made by Futaba. Tested and working. 1 x Futaba 35mhz Transmitter FM Crystal/X-tal suitable for model aircraft and helicopters only. TX Channel 68 (35.080mhz). TA Crystal AM 27 MHZ - 27.225 SPLIT FREQUENCY for Futaba Acoms & others. Only TA crystal for 27Mhz transmitter and receiver. Frequency 27.1225 designated "Green/Blue Split". Hopefully this will be useful for someone who has the other crystal to pair up with this one. GENUINE FUTABA CASE INCLUDING 6 SETS CRYSTALS 35 HZ,,,. The crystal is made by Performance Devices and is stated as being 'For Futaba radios'. 1X FP-R112JE BEC 2 CHANNEL RECEIVER TX & RX CRYSTALS. Crystals will work with various other standard modular R/C interchangeable 27Mhz AM gear e.g. Futaba, HPI, KO Propo, Hitec etc. 27.145 MHz PAIR of XTAL "YELLOW" BAND 4. 1 x Tx crystal. Didnt get transmitter, tested with ACOMS Tx and all worked great. 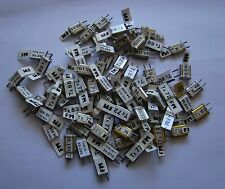 This sale is for only a TX 35.060 MHz crystal and holder. Great for someone who has the other crystal to pair with this one.